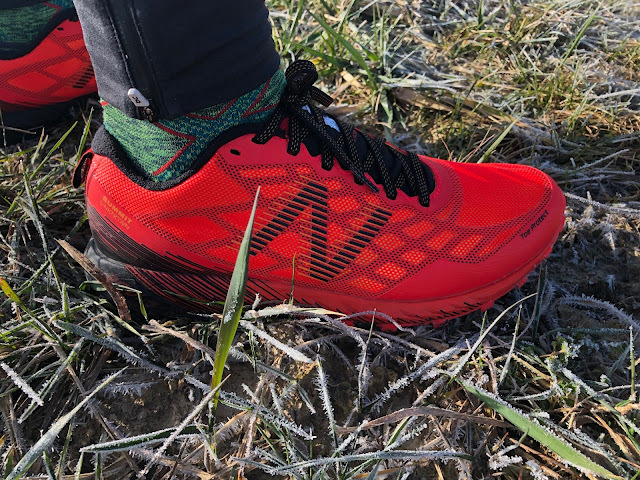 Sam: The New Balance Summit Unknown is a light, agile, and protective trail runner/racer which sets the bar very high for performance and all terrain versatility. Very stable, it is firm but not overly so, and has a very supportive and comfortable snugger upper ideal for its speed purpose. Its directional 4mm lugs provide good all purpose traction and also help make it excellent on road, making it a very fine hybrid. It can be characterized as a New Balance 1400 for trail. It shares the 1400's light weight although as a trail shoe it weighs approx. 1.5 oz more, agility, 10 mm drop and Revlite midsole while adding a RockStop plate, more trail oriented upper and the lugged outsole. New Balance told us it should fit similarly to the upcoming 1400v6. It is somewhat "more shoe" underfoot and up top with a slightly more relaxed fit than the excellent NB Vazee Summit Trail v2 (RTR review) one of my trail favorites of 2017. It does gain about 0.5 oz over the Summit Trail which I assume mainly comes from the additional outsole coverage density and to a lesser extent the upper. Midsole Stack: 19mm heel/9mm forefoot, add 4mm lugs and sock liner for approx. total 27/17. $110. Available now including in 2E Wide. See retailers below the article. Sam: Summit Unknown fits me true to size. It has a consistent secure fit from heel to toe. The toe box is narrow but has no pressure points given its soft mesh. The look screams speed and security with the extensive web of foot forming underlays contrasting with the rich orange red color. The mesh is soft over the toes so there is plenty of toe overhead room for me. It is a relatively narrow shoe but not unpleasantly or uncomfortably so. Jeff: The Summit Unknown is light in the hand and fast looking with a supportive looking upper, aggressive lugs, and is reminiscent of a S/Lab shoe. Great looking deep lugs and effective lug pattern. An extensive array of underlays sits below the outer mesh, well protected from trail hazards. Inside that, and covering the underlays is a very thin mesh laminate to keep out trail dust but which should allow good breathability and drainage. The inner construction features a stretch bootie which incorporates the tongue which is very similar to the Summit Trail. The stretch tongue is lightly padded and provides enough padding over the lace up. It is important to firmly pull the tongue up prior to lacing as it will want to stretch back towards the front otherwise. The stretch in the tongue, if properly pulled up and laced, along the upper and its overlay,s provides a great overall "custom" foot hold which I find adapts well to terrain variations with less of the tendency to want to try to collapse medially at mid foot felt in the Summit Trail v2. The heel counter is firm and substantial. The Toe Protect bumper is fairly firm but not noticed as it does not extend over the toes and the soft mesh. While snug up front there is enough vertical toe wiggle room. Jeff: I found the upper to fit true to size, but is somewhat narrow in the forefoot with very little, if any wiggle room in the toe box, even for my low volume foot. On my very first run, I got a blister on the top of my right pinky toe, but I was wearing a very thin sock and was blasting very steep and demanding downhills. After allowing my blister to heal for a few days, I started wearing slightly thicker socks, went a little easier on the downhills and did not get another blister, but the tops of my pinky toes felt a bit hot at times. I think as I run in the snow and mud, the shoes are getting wet and breaking in more, which is definitely helping to reduce that pressure point. Fit is very performance oriented and is easy to lock in perfect and secure hold on the very first lacing without ever having to readjust. The laces are flat with just the right amount of stretch to them and integrate well with the eyelets, where I can cinch easily without a fight or losing tension as I tie. 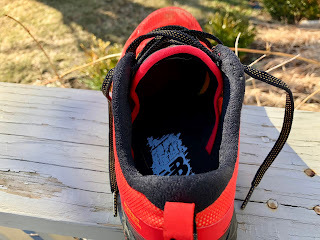 The stretch bootie style tongue/upper aids in comfort, security and foothold, but when putting on the shoe, I find that I have to work a little to pull the tongue up and back to fix the bunching that occurs when sliding my foot into the shoe. No big deal, just of note. The toe bumper is minimal and integrates with the structural underlays. Ventilation is excellent, as the mesh is open and airy. The midsole geometry appears to fill in the mid foot area with more of a bowing out than the Summit Trail's more abrupt vertical side walls. Combined with the new upper and more extensive mid foot lugs and outsole, this additional mid foot support is clearly felt. 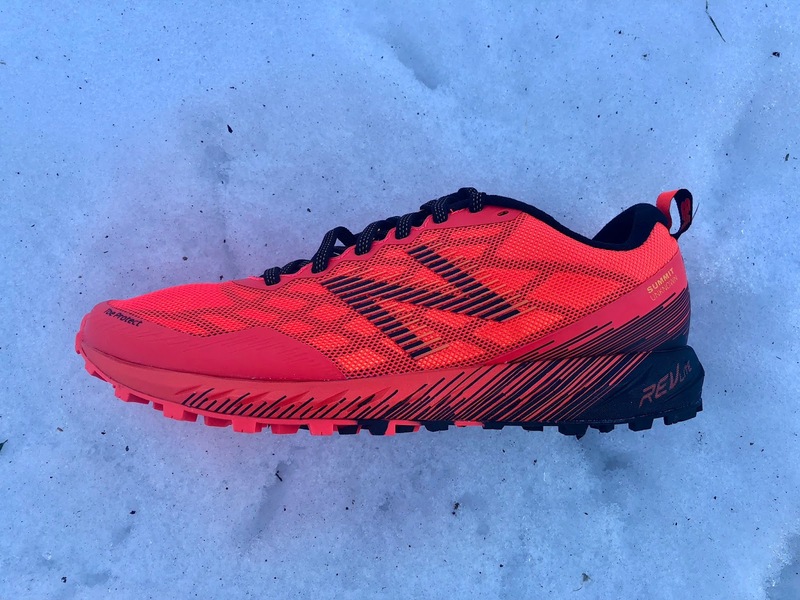 Jeff: The Revlite midsole is on the firm side, but fast and responsive with enough cushion/protection for fast runs over mid distances and on just about any terrain. I find the Revlite to be much better than Fresh Foam for trail use, as it is more responsive, appropriately firm, and does not compress as quickly. 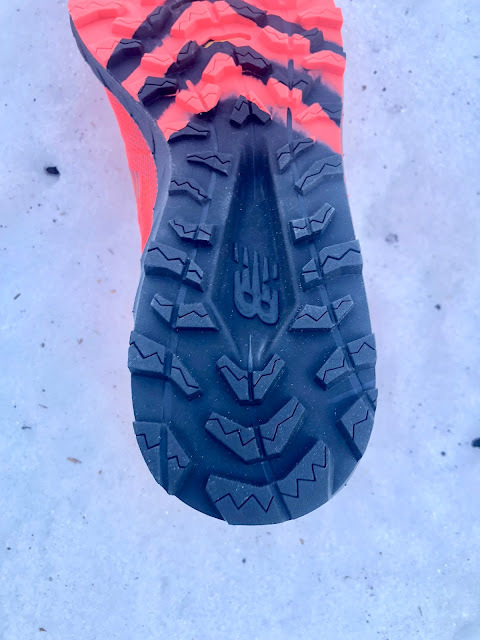 The Hydrohesion outsole sees a change from the Summit Trail getting a denser array of lugs including at mid foot where there were none in the Summit Trail. The outsole really takes the edge off the firm RevLite foam. The soft ground performance suffers somewhat with more mud accumulating, especially in the heel mid cavity and from the denser array of lugs overall. I think this new array which now includes lugs at midfoot, combined with the cored out area in front of the heel, makes the Unknown more versatile and more comfortable underfoot on firm terrain and even roads than just about any trail shoe I have run. with the possible exception of the heavier Salomon XA Elevate (RTR review), also a versatile do anything trail shoe. 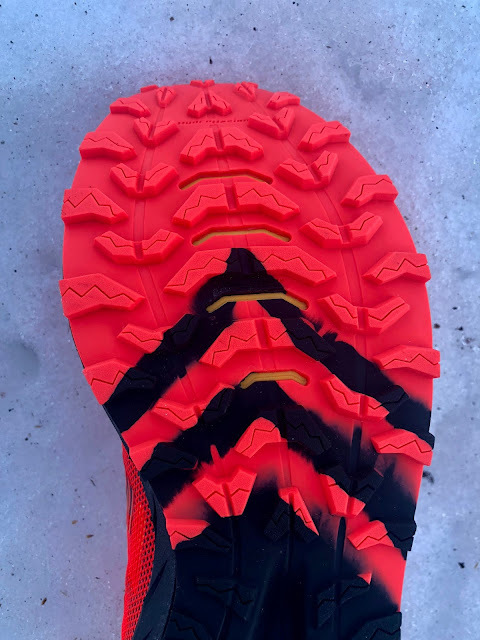 The RockStop plate appears to be a bit shorter and is no longer called out as 3/4 but as Forefoot and thus does not extend as far back under the mid foot as in the Summit Trail. This gives the Unknown a more distinct flex point whereas the Summit had a longer somewhat easier flex but no distinct flex point as Unknown has. As a result the Unknown is an very good on uphills. The rock protection is excellent but you will feel the trail and the rocks given the relatively thin forefoot stack. Trail feel and agility over terrain is excellent. Jeff: The Hydrohesion outsole of the Summit Unknown is remarkably effective and grabs well in a wide variety of situations from steep off trail, rocky technical trails, snow, slush, limited ice, mud, wet rock and dry rock. 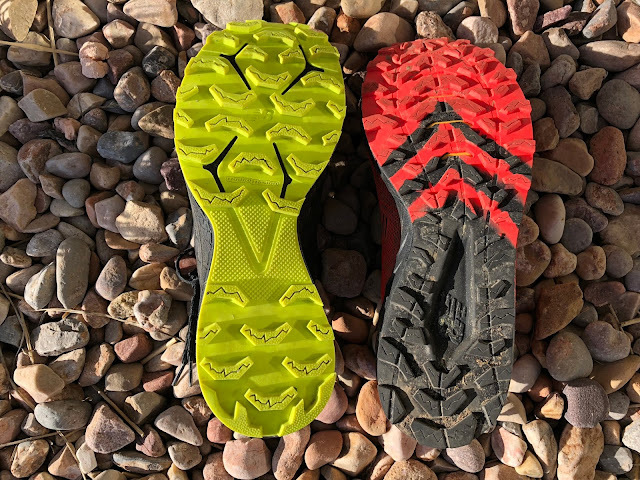 Occasionally on smoother wet rock however, I feel a little more slippage than I might with a Salomon Premium Wet Traction Contagrip outsole, but is still pretty darn good and above average when compared to the majority of shoes I have reviewed. So far, durability is good, as I hardly see any evidence of use after 30 or so miles on very rough and rocky terrain. The closer together lugs tend to hold mud, but as I was running through mud, they seemed to grab pretty well, so it seems like the mud is cycling through at least instead of becoming hopelessly stuck. I am really only aware when I get home and notice there might still be some stuck in the lugs, but seems to clear out quickly. Sam: Wait a minute what are they doing on an indoor track? I ran all matter of "terrain" in my testing from a track, plenty of paved roads, rocky dirt roads, some fields, and some rooty, rocky single track. I did not get on highly technical mountain terrain due to snow coverage. On all terrain the Summit Unknown was agile, stable, well cushioned and fun to run. Roads were a big surprise as I even got in a 12 miler through the Swiss countryside with a mix of pavement, concrete, farm roads, and fields. Everywhere I went the Unknown was well if firmly cushioned, very stable, and responsive. The forward toe flex does favor faster paces. Grip was excellent on all surfaces. Sam: I found the Summit Unknown to be an outstanding choice for all around, less than super technical trail running, at speed and for moderate distances. 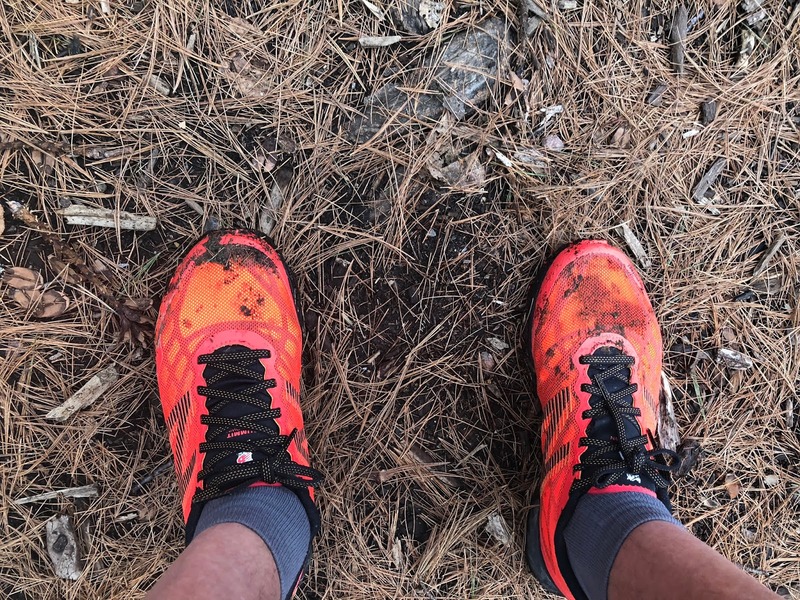 I tend to like such a shoe for my 5-15 mile runs where I will see a mix of terrain and where some agility is needed and it for sure fits the bill. Some may run it as an ultra shoe or on technical terrain for its agility despite its firmer cushion and relatively thin, if well protected forefoot. If I was to recommend improvements it would be to move a few millimeters of heel stack height to the forefoot. -0.4 for thin forefoot cushioning on rougher terrain and for longer distacnes. Move some stack from the heel to the forefoot while maintaining flexibility and it would be near perfect. -0.1 for length of stretch tongue. It could be a bit longer or a touch less stretchy. 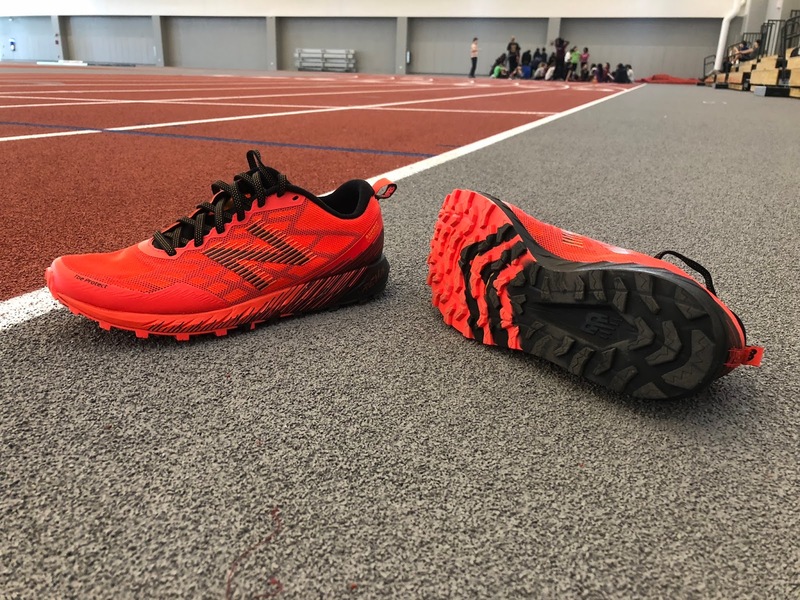 Jeff: The Summit Unknown makes for a great race shoe or up tempo trainer for up to mid distance on a wide variety and especially technical terrain. Despite the initial blister issues, the upper of the Summit Unknown is softening and breaking in to the point where it is less of a problem, but pressure remains and I find myself being cautious. 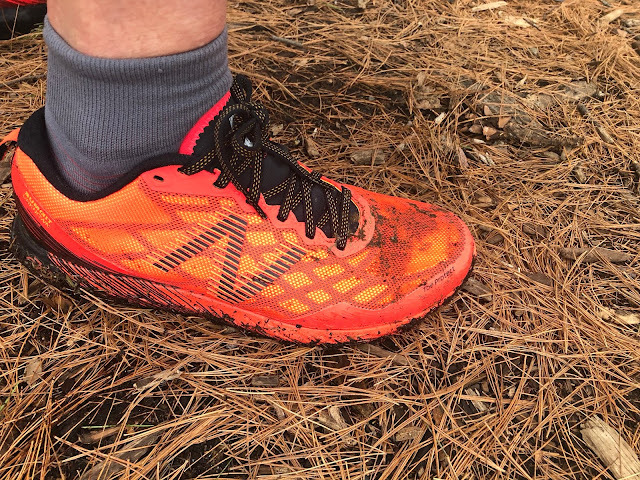 Cushion is on the firm side, so I would probably look to a shoe that is more plush and with a more forgiving fit for anything longer than 2 hours, but for faster, shorter efforts on technical terrain, it is a great pick. - .3 for fit. Would like just a little more room or at least some forgiveness in the forefoot. - .2 for firm cushion coming across as a touch harsh on hard surfaces. 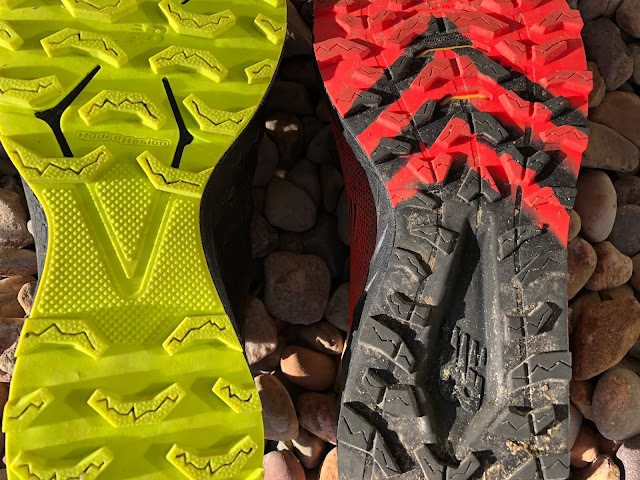 New Balance Summit Unknown vs. Vazee Summit Trail v2 (RTR review) The Unknown improves on the Summit Trail with an improved upper and and an outsole suitable for a wider variety of terrain, including firmer smoother terrain. It is more stable, comfortable and versatile. New Balance has slotted the Summit Unknown to plug a hole in their line between the very minimal MT10v1 and their heavier trail shoes such as the 910v4 and Hierro v3. Notice the colors? One could also say the Unknown is filling a market gap for a decently protective, lighter, faster racer in Salomon's S-Lab line between the very minimal Sense (RTR review) and the now heavier 2018 Ultra (RTR preview) It is is more stable and responsive for me than the 2017 S/Lab Ultra (RTR review), and may match up most closely to the upcoming Salomon Sense Pro 3 which is at about the same weight (RTR preview). 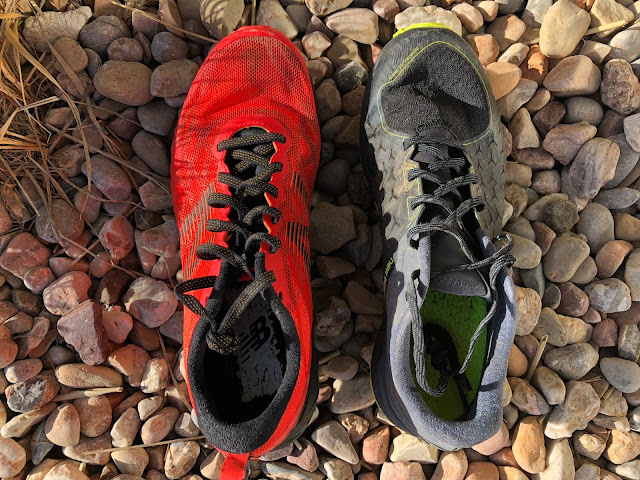 And Summit Unknown is $70 less than S-Lab models..
New Balance Summit Unknown vs. Salomon S-Lab Sense Ultra (RTR review) - The Summit Unknown is a little lighter, but with beefier lugs and a more sturdy protective feel underfoot. Even so, I find I can run for a few hours more in the Salomon, as I find the cushioning to be a little more forgiving and the upper more compliant. Saving $70 and buying the Summit Unknown though is very appealing. 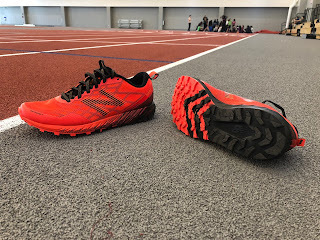 New Balance Summit Unknown vs. Brooks Mazama 2 (RTR review) - again close in weight and both fast race worthy shoes. The Mazama 2 is more responsive and hands down the fastest uphill only shoe I have ever run in, fit is more forgiving, but the Summit Unknown has superior traction and much better security and control for point and shoot downhills, especially in technical terrain. New Balance Summit Unknown vs. Salomon Sense Ride (RTR review)- Close in price, the Ride is has a bit more of a relaxed fit, protection and cushion are similar, but the Summit Unknown is much faster and more agile. For longer outings and if you have a wider foot, consider the ride. For a narrower foot and pure performance, check out the Summit Unknown. 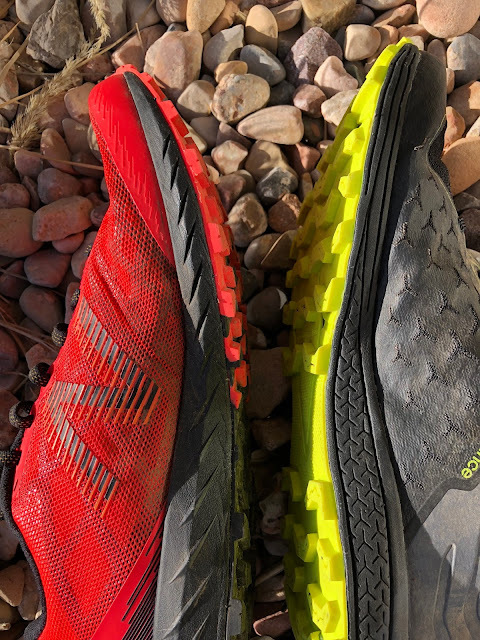 New Balance Summit Unknown vs. Scott Supertrac RC (RTR review) - close in weight, fit and performance, the Summit Unknown has a more durable outsole, but not quite as sticky as the RC and the RC, though fit is performance level, I got no hot spots. The Summit Unknown retails for $40 less and Scott is no longer available in the US market. Sam Winebaum is the Editor and Founder of RoadTrailRun. He has been running trails and roads and run shoe geeking for 45 years. As he turned 60 in 2017 he was thrilled to clock a 1:35.24 half. The Summit Unknown was provided at no cost. The opinions herein are entirely the author's. 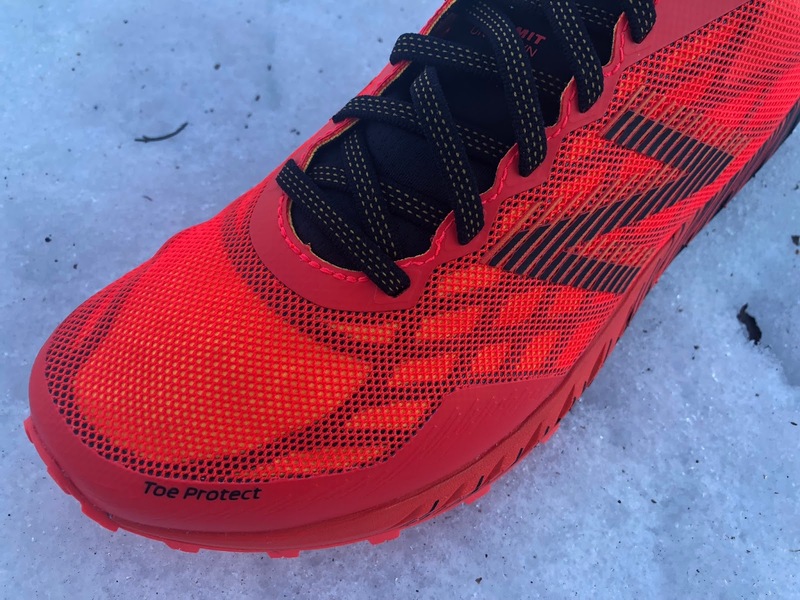 Thanks for the review, as this shoe has been on my radar because I run light trails with the NB 1400V5 and was looking for more protection. I was wondering how they compared with the NB Gobi 2? It is about 9 oz. with 17/23mm and based on the Zante? I never ran in it, and didn't really care for the fit of the Zante, but was wondering if you did? I'm glad they made the under arch wider than the Summit because I found the Summit was just too unstable for me-and sent them back after trying in the house. I too thought NB would be wise to lower the drop to 8mm in the heel and exchange 2 more mm up front (on the 1400) The forefoot of the 1400 is just too thin for me for over 10K. Thanks for writing. I ran the Gobi 1 and liked it a lot. It leans more towards road than trail and if I recall is a bit softer and of course has less aggressive lugs. If your trails are light it might work as I ran it on smooth single track in UT with no issues but would hesitate except for short stretches to run it on rooty rocky stuff here in New Hampshire. As for the Summit Trail I found the arch pretty carved out but only noticed really noticed it when I ran a very wet and muddy 25K trail race where my feet got quite sore. Thx for the review. My friend recently gave me a pair of the Vazee Summit V1's and it was a gamechanger for me. Very lightweight and grippy - great for technical trails. 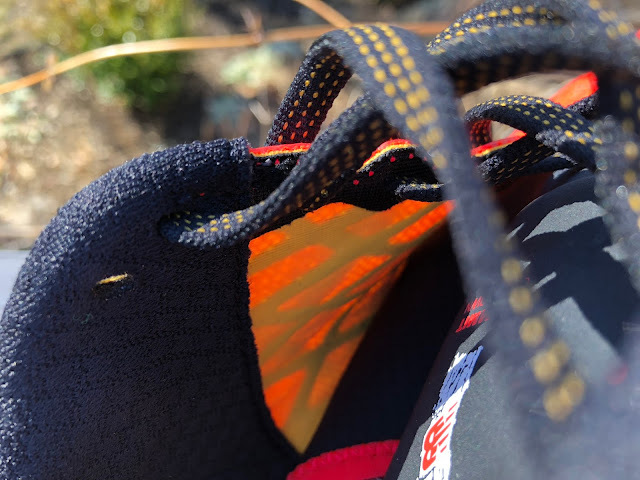 Unknown is yet more versatile but may suffer a bit in the wet compared to Summit Trail, I expect Running Warehouse will carry and according to New Balance release date is early April. Really pumped for this shoe. Any idea whether NB will offer the Unknown in widths, as they did with the Vazee Summit? Have just asked NB about widths and when I hear will post a comment and change review if need be. Have only perused through a few reviews but they are very in-depth and appear to be free from bias! I love the sound of these shoes, but that drop sounds so big! Did you find that the heel got in the way of forefoot running? Given the firmer midsole drop is noticed but not an issue for me. What do you run in now? Maybe a touch less agile than Summit Trail but more stable and better suited to longer runs. I am slowly weening off the MT10 and running more often in the S-Lab Sense's although I wasn't crazy about Salomon's latest iteration of it. I like to stay agile. Hmm. Interesting. We have a lot of technical trail out here in Austin and I found the Vazee V1's sloppy through that kind of terrain. That being said, I only know of a few folks on the internet that felt the same. I'm willing to at least check out the V2s and the Unknown's. Good to hear the arch has been filled in somewhat, as that was my primary issue with the VS; it's hard to see fitting this in my rotation, however, not needing high drop for Achilles issues, and many other shoes will do just as well for shorter outings. Thanks for the reviews! I tried the NB Gobi 2 from your experience with the Gobi 1. I found it to be a great shoe with (from what I read elsewhere)has an updated upper and 4mm (bigger & sharper) lugs for better traction on trail. I put an old NB 1400V5 insole in them and they feel better than the stock thin Zante type insole and offer a tad more cushion and protection. My only problem with them is the heel counter is a tad low, but other than that a great, light, fast feeling shoe with pretty good "bounce". You all might want to review the Gobi 2 for everyone in the future? I've got my Summit Unknown coming from RW, and can't wait to run in them! Of course, I used the RTR10. :) Thanks again for your reviews and the nice discount! Keep up the good work. Oh, the ‘shorter outings’ comment was more along the lines of wearing bricks or vibrams if it’s short enough, but i’m A bit puzzled by the RW description, that this uses a ‘racing’ last, but apparently has 2mm more stack than the V2 29/19 vs 27/17 and a more filled-in arch. Anyway the direct answer is i’d Immediately choose the Sense 6 for an actual trail race of say 13M. The SU looks like an effort to broaden the appeal rather than narrow it to racing. I’d certainly choose this over the V2 if buying now, as The lack of medial arch support became an issue for me on longer runs. But i’ll Likely never again buy a 10mm drop shoe with such a narrow base of support: 8mm is pushing it as I’ve found with the Montrail MM4 & Inov-8 285.— 6mm or less is better. Got a pair and these are GREAT. Feels like a trail version of a racing flat..
My only complaint is that the tongue does not stay in place during my runs. I will pull the tongue all the way up when lacing up my shoes, then by the end of the run it's slid wayy down. Kind of annoying. Agree with you a great fast shoe with a tongue that could use some work and deducted some fractions for that. Almost to stretchy so rebounds back down and is to short. Kinda unrelated, but Scott is out? That's why I'm having to order my Supertrac Rc's from Europe I guess;-) Perhaps I'll have to give these NB's a shot, but ultimately I'm hoping that the next incarnation of the Sense Pro (3) will fill the hole in my heart...and be easier to obtain. Love this blog! Thanks Anonymous! We're working hard and running to do it. Yes it appears Scott has exited US from what I heard. Sense Pro 3 is closer to fall so in the meantime Summit Unknown is a good and who knows may be a better option! #2. They need to put the "silent Hunter", insole from the NB 1400V5! 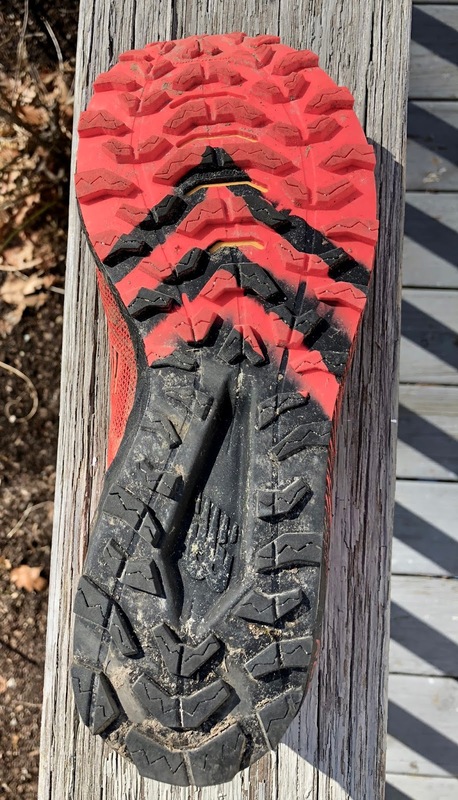 I changed out insoles, and the denser, firmer, Silent Hunter made the ride more comfortable, with less rock feel, but I could still feel what my feet were stepping on-in a good way. :) The only problem is it is 1mm thicker, and takes away from some headroom-but not much. I have a low volume foot and it is good with the thicker insole in. The stock insole compresses way too much, IMO. I noticed was slightly more weight in the Summit Unknown, slightly better rock protection in the forefoot, and slightly more heel cushion. Because of this- and other things I found when I measured, they seem to run like a lower drop than the 1400V5 too, like 1-2 mm lower in the heel-IMO. #4.They are pretty well the same stack heights (sidewall & lugs), same length and same platform. I'm getting 18-19mm in the forefoot, 32-33mm at the highest on the heel. The foam is softer in the Summit Unknown, but it has a 1mm rubber platform the 4mm lugs sit on. The 1400V5 has the same 1 mm, but it is split up, not one solid sheet, and has 3mm smaller lugs. I'm thinking they went with softer foam because of the solid sheet of rubber, and the rock film? #5. In the 1400, you sit on top the foam in the heel, I believe in the heel area of the Summit Unknown, you sit down into the midsole foam a tad, making them feel more stable. If I'm right, this is why they feel like they ride a touch lower in the heel-like 8mm. This is more noticeable when you have the 1400V5 on one foot, the Summit Unknown on the other, and with the thin insole. How do you feel the sizing of the Unknowns compares to the Summit V2's? I normally wear 13's in New Balance, but found in the Summit V2's I had to upsize to a 14 as the toe was a bit too tight on the 13. On my second pair of V2's currently and want to give these a try. Just curious if I should stick with the V2 sizing in mind or give the Unknowns in 13's a shot. Update after running two 10 milers on some rocky, hilly, single track. They ran real well and had good protection with the NB 1400 insoles in them. The tongue was a big issue with me, so I took a scissors and carefully cut the bootie to turn it into a regular tongue. Then I cut along the insole with a razor blade to take the excess material from the bootie off. Works like a charm now with minimal slide down! I have a pair on their way. Because I'm consistently seeing reviewers (or is it just one of you) stating that the RC1400 insole is put to better use than the Summit Unknown's stock version, does anyone know where I can procure the 1400 insoles? I'm having no such luck and would think finding original replacement insoles are a thing you can find/buy. How do they compare with the XA Elevate? Thanks for asking and reading. Editor upper is roomier. but nonetheless super well held I would take the XA Elevate onto rougher terrain where I might not the Unknown and longer runs and use the Unknown for faster shorter trail runs where the XA Elevate is a bit to much shoe..